Founding Amplified Elephants member Kathryn Sutherland demonstrates the RESONANCE table for the audience after the concert. The lights are dimmed already, giving this small but regal room in Bendigo’s Capital Theatre a warm, apricot hue. The dull glow offsets two veiled television-sized monitors placed on a ledge above the five black-clad performers. We sit around what looks like an overhead projector: a large horizontal screen with an optical lens perched on a stem above it. 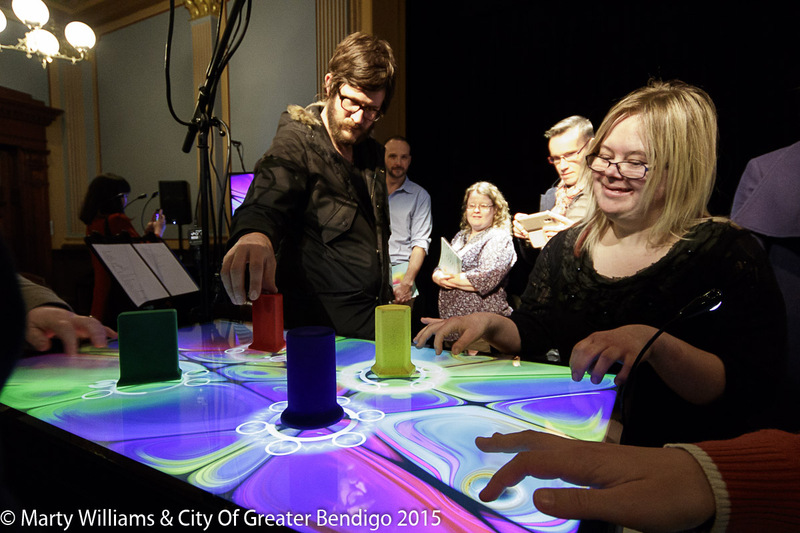 These performers are the Amplified Elephants, a sound art group based in Footscray whose members live with intellectual disability. Formed in 2006 as an offshoot of the sonic art collective The Click Clack Project, they have created a diverse range of projects using experimental techniques to evoke soundscapes and make performance art from new technologies, prepared traditional instruments and found objects. Guided by Artistic Director James Hullick’s gentle prompts, performers improvise short solo sets. The piece builds in the first movement with Jay Euesden’s concentrated, space-activating pokes and Teagan Connors’ broad, multi-fingered glides. In the second movement, following an extended drone, Kathryn Sutherland masterfully drives the piece to peak intensity. We hear squelching, screechy and swampy sounds; an array of tropical bird-calls; excited human hollering; and a medley of straw-sucking and blowing. With one or two measured looks, Robin McGrath invites the audience to engage on a more personal level with this act of the creation. The ensemble place and adjust hand-sized coloured blocks on the screen, which triggers trippy tie-die swirls and graphics evoking a cell nucleus and its spinning electrons. Upon tapping, the electrons shoot along lines extending mandala-like from the base of each block to synapse with the lines generated by others. The cellular representation here, in the tablet’s graphics, thematically coheres with the piece’s other key symbols: the title, referencing Charles Darwin’s notion of natural selection; the male voiceover which challenges those readings of Darwin which promote the notion of ‘survival of the fittest’ over other less reductive understandings of how humans have evolved; and the prerecorded backing track, which forms a foundation for the semi-improvised performances. A striking example of this backing track’s effect occurs in the piece’s opening moments. Before there’s any action, we’re enveloped by a loud and low, dubbed hum from the surround sound system. It holds a tightly looped rhythm, as if an old computer program scrolling through endless options. Or, more ominously, is stuck on one option. Either way, no selection is made. This symbolic system suggests that while genealogical science might be undeniable, we should not let it limit the infinite ways we can practice art. Perhaps more importantly, it suggests that our continued evolution, including our ability to adapt to conditions like climate change, depends on acknowledging biological capacities we may already have developed, but ignored. It’s a perspective which links this performance text closely to the raison d’etre of the group performing it. If the Elephants, as bearers of intellectual disability, are the ‘elephants in the room,’ their amplification of that position represents their way forward, which is actually a way in. As the voiceover says, ‘meta-listening,’ a biological feature perhaps developed by our distant ancestors, involves just such a process of shining awareness on the functional, and the willingly unseen or unheard. Select Naturalis seeks to metaphorise that awareness and, it seems, achieve real social affect: community, inclusion, technological progress and ever-better names for things.